There IS treatment for your pain! Early pain treatment prevents prolonged suffering and once a pain problem has been diagnosed, Dr. Friedman uses his 20 years of experience in Neurology and Pain Management to provide caring, individualized treatment to the patient. Dr. Friedman has been caring for people suffering from neurological and chronic pain conditions for over 20 years, and has spent the last 15 years helping patients in South Florida. 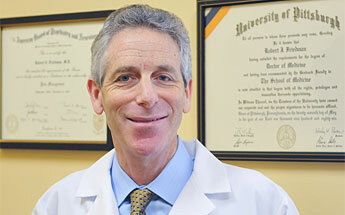 In 1998, he founded the Headache and Pain Center of Palm Beach, with offices located in Lake Worth and Jupiter. Robert J. Friedman, M.D. is double board-certified in Neurology and Pain Management by the American Board of Psychiatry & Neurology (ABPN.) He is certified by the American Board of Independent Medical Examiners and the American Society of Neuroimaging for MRI and CT and has been designated an Expert Medical Advisor by the FL Division of Workers’ Compensation. With a Doctorate of Medicine from the University of Pittsburgh and a medical internship in Internal Medicine at Allegheny General Hospital, Dr. Friedman completed his residency as Chief Resident in Neurology at Dartmouth-Hitchcock Medical Center. He received additional training as a Clinical Fellow in the Department of Neurology (Pain Management) at Johns Hopkins University, in Interventional Pain Management at the Florida Pain Clinic, and in Transcranial Magnetic Stimulation (TMS) at Harvard Medical School. In 2010, Dr. Friedman co-founded BrainStim Health and TMS Center, where he and staff provide traditional and innovative treatments for depression, mood and psychiatric disorders, as well as neurological and pain conditions.